MJM: I want to address the 900-pound gorilla in the room—the controversy surrounding Pope Francis’s post-Synodal exhortation, Amoris Laetitia (AL). The document, especially Paragraph 305, has been described by various priests and theologians, you know on EWTN and elsewhere, as “dangerous,” “very disturbing,” “very problematic,” “a big mistake,” “a direct contradiction of Pope John Paul's Familiaris Consortio,” and so forth. First of all, Your Eminence, how authoritative is AL, and are we talking merely about scandal here, or do these problematic paragraphs savor of heresy? Cardinal Burke: Well first of all, as I stated from the beginning, the very form of Amoris Laetitia, and, actually, the words of the Pope within the document, indicate that it is not an exercise of the papal magisterium. And the way the document necessarily is read, as with every document, is in the light of the constant teaching and practice of the Church. And so the statements in AL which are in accord with the Church's constant teaching and practice certainly are very fine. But there are a number of statements that are at best confusing and they must be clarified and that's why four of us cardinals posed, according to the classic practice of the Church, five questions to the Holy Father having to do with the very foundations of the moral life and the Church's constant teaching in that regard. And it's clear that we, in presenting the dubia and asking those questions, that we believe that if they're not answered, there's great danger of a continued confusion in the Church, which is leading souls into error with regard to questions that have to do with their very salvation. So certainly, without the clarification of these questions, there is a potential of scandal. With regard to the question of heresy, one has to be very attentive to material heresy and to formal heresy. In other words, material heresy: are there actual statements in the text which are materially heretical? Are they contradictory to the Catholic Faith? Formal heresy: did the person—namely the person of the pope who wrote the document—intend to proclaim heretical teachings? And the last thing, I don't believe myself at all. And I think with regard to the first question, the language and so forth is confusing and it's difficult to say that these confusing statements are materially heretical. But they need to be clarified, and to refuse to clarify them could lead people into error, into radical thinking with regard to some very serious questions. MJM: If nothing does change and there is no clarification forthcoming, and since we're talking about the Church's teaching on the indissolubility of marriage—and given that marriage is already so embattled, with rampant divorce and now even gay marriage—what do you foresee as the ramifications of AL, especially paragraph 305 and footnote 351, if no clarification comes, not only for the Church but for the whole world? Cardinal Burke: It would be very devastating. Recently I read a column by Ross Douthat in the New York Times, commenting on an application of AL in the Diocese of San Diego. He said, correctly, that if this interpretation of AL should be correct and acceptable then the Church's teaching on marriage is finished. And we can't have that, of course, because it's the law which God wrote on the human heart from the very creation; it’s the order, the law, which Christ confirmed in His teaching in a most clear way, as is recounted in Matthew Chapter 19 in which He confers the grace of a Christian sacrament. So the dubia must be answered. The questions have to be answered in accord with the Church's tradition in order that the Church carry out her mission for the salvation of the world. If the Church were simply to accept the way of our culture, with regard to marriage, then she will have betrayed herself and betrayed her Lord and Master, and that we just simply can't permit. MJM: Now, in a private letter of September 5th to the bishops of Buenos Aires, Pope Francis wrote: “There are no other interpretations of Amoris Laetitia,” other than one admitting divorced and remarried Catholics to Holy Communion in some cases. He is so adamant about this, Your Eminence. So, is it even possible for you to envision a scenario whereby you suddenly discover that you've missed something, that the Four Cardinals are misinterpreting it, and that you'd have to concede you were wrong? I mean if that’s not possible, then what is the point of the dubia? Don’t you already know the answers to your five questions? Cardinal Burke: Certainly we do. But the important thing is that the pastor of the universal Church, in his office as guardian of the truths of the Faith and promoter of the truths of the faith—that he make clear that, yes, he answers these questions in the same way that the Church answers them. And so what he wrote in that letter simply means that this is his personal understanding of the matter. But that letter hardly could be considered an exercise of the papal magisterium. And so, it's a painful situation in which to be involved but we simply have to press forward to clarify the matter. MJM: Your Eminence, in this age of dialogue, Pope Francis himself has called for “open discussion of a number of doctrinal questions” and he said that the thinking of pastors and theologians if they're faithful and honest and realistic and creative “would actually help to achieve greater clarity.” So, what can be inferred from his decision not to dialogue with you in your quest for that very clarity on this most fundamental point of moral theology? 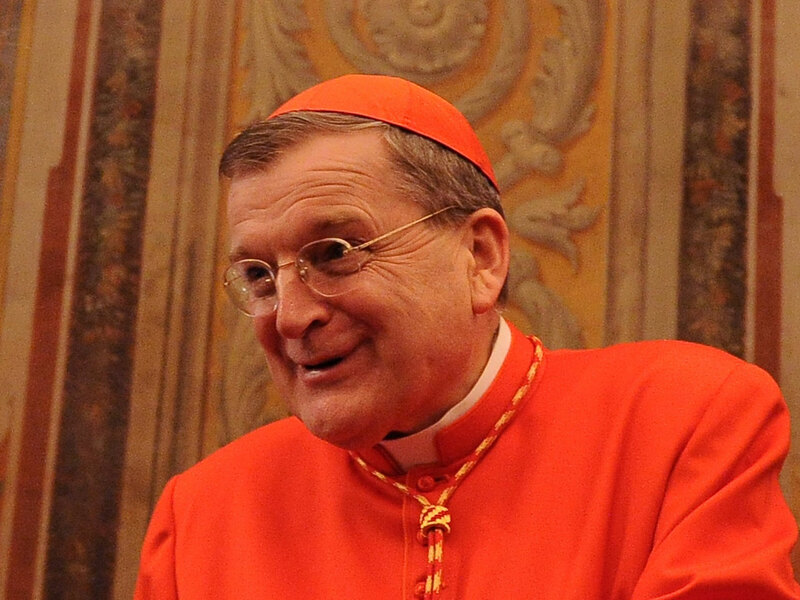 Cardinal Burke: Well I think, to put it plainly, people have accused us four cardinals of a disrespect for the papal office, of an inimical attitude towards the Pope. This is not the case at all. We are cardinals. We have a very serious responsibility to assist him and, for that reason, we brought to his attention these questions which remain in a document which bears his signature. And we can’t do otherwise, and the Church can't do otherwise. And so the matter will have to be resolved certainly. We've initiated a conversation by raising the dubia. And when we were informed that there would be no response, then we knew we had to bring the conversation before the whole Church because so many faithful—so many priests and bishops—are expressing a great confusion in this matter, and also by recounting how these divisions are setting up more divisions in various parts of the Church between bishops and priests and lay faithful on fundamental teachings of the Faith. Well, that's the work of the devil. The Holy Spirit generates unity and the daily conversion of life to Christ that helps us to overcome our sins and to live in accord with the truth. And so this division, this confusion, has to be addressed and remedied. Does that make sense to you? MJM: It absolutely does. And obviously, it seems to us, as lay faithful looking on, that that's your job – your duty before God. Cardinal Burke: In fact, you know some people have said to me: “Well why did you publish these dubio? He’s the Pope. You should have been satisfied.” But, no, that’s not sufficient because everywhere I go—and I travel a lot now—everywhere I go people are saying: “What's wrong with you Cardinals? There are these serious questions, and yet you remain silent. You don't say anything.” And they’re correct. If we were to remain silent it would most definitely give the idea to the faithful that everything is fine, but everything is not fine. Cardinal Burke: I don't even think about it. I mean, certainly, it's possible. It's happened, historically, that a cardinal has lost his title. But I don't think about it because I know what my duty is and I can't be distracted from it by these kinds of thoughts – you know, worrying about whether I’m going to be in some way persecuted for defending the truth. As I said, one person said to me: “Aren't you afraid to insist on these matters?” And I said that what I'm afraid of is to have to appear before Our Lord at the Last Judgment and having to say to Him: “No, I didn't defend You when You were being attacked, the truth that You taught was being betrayed.” And so, I just don't give it any thought. MJM: Well what you just said, Your Eminence, is something I pray becomes contagious in the life of the Church and at the highest levels. But you know, you have a lot of support. In fact, in expressing their support for you and the other three cardinals, a number of high profile pastors and academics and professors, both here and in Europe, signed a letter of support a few weeks ago in which they pointed out that, as a result of the widespread confusion and disunity following the promulgation of AL, the universal Church is now entering a “gravely critical moment in her history” that, according to them, has alarming similarities with the great Arian crisis of the Fourth Century. I'm curious to know: Do you agree with that? Do you think this has the potential to escalate into something similar to the Arian crisis? Cardinal Burke: Well, it does, and in the sense that as long as confusion spreads more and more about a fundamental truth of the Faith. Now in the case of the Arian crisis, it had to do with the two natures in the one person of Our Lord Jesus Christ. But here we're dealing also with a very fundamental truth, two fundamental truths really: The truth about Holy Matrimony and the truth about the Holy Eucharist. And if this confusion doesn't stop, we will have a situation where you will have within the Church large bodies of people who don't believe the Catholic Faith, as, for instance, St. Ambrose encountered when he became Bishop in Milan. So you know, it's a serious matter, and I don't think that they're being extreme by making that observation (a comparison to Arianism). I don’t think they’re being extreme at all. MJM: Bishop Athanasius Schneider, who seems to be sort of your wing man at this point, supporting you, thanks be to God—in his letter of support for the Four Cardinals, he speaks of what he calls “intolerant reactions to your dubia”, and he points out that the Four Cardinals have been castigated as “witless, naïve, schismatic, heretical and even comparable to the Arian heretics.” So this has to be hurtful to you personally, obviously, Your Eminence. But what has gone wrong in the Church when a simple request for clarity on a matter of morality and doctrine is met with was such a visceral reaction on the part of members of the hierarchy? What has gone wrong? Cardinal Burke: I'll tell you what I think has gone wrong, and that is a very worldly, a very mundane way of thinking has entered into the life of the Church. The Church is divided into political parties and so forth, instead of the unity of all Catholics and the unity in Christ. And this worldly way of thinking then permits people to engage in this kind of intemperate and ridiculous ad hominem approach. The dubia are stated very respectfully; they're very honest questions and they merit an honest reply. And what I see in these intemperate reactions is a sign that the people who don't want to answer our dubia in fact realize that they are not on solid ground. They can’t answer the dubia correctly and so they try to discredit the person who raised the questions. It's an old human reaction, but it's mundane, it's secular. It has no place in the Church. MJM: So what's next, Your Eminence? If Pope Francis fails to answer your dubia, what's the next course of action? You've spoken of the possibility of elevating this to a formal correction. But what exactly does that look like? Cardinal Burke: Well, it doesn't look too much differently than the dubia. In other words, the truths that seem to be called into question by AL would simply be placed alongside what the Church has always taught and practiced and annunciated in the official teaching of the Church. And in this way these errors would be corrected. Does that make sense to you? MJM: Yes, absolutely. This is a little off topic, when I was in Rome covering the Synod last year, I noticed this constant theme throughout—this idea of accompaniment, the ‘Church of accompaniment’, as though Holy Mother Church didn't know how to accompany the sinner in the past. That confused me, but it also seemed to be going further. Cardinal Peter Turkson, for example, assured us in the Vatican Press Office that at the next Synod this ‘Church of accompaniment’ would address so-called ‘gay unions’. Do you foresee change coming even in the way this pontificate ‘accompanies’ those who are in gay unions? Is it possible that next year at this time, we might be discussing dubia on a post-Synodal exhortation that appears to approve the gay lifestyle? Cardinal Burke: Well, this notion of accompaniment certainly has no classic theological or doctrinal meaning. And it certainly doesn't justify calling into question the moral truths, especially regarding acts that are always and everywhere evil. And if accompaniment is understood in that way, you're quite correct — it could lead us into all kinds of very damaging and very confusing discussions. But I think that this false notion of accompaniment as it has manifested its harmful effects in the discussion of the situation of those who are in irregular matrimonial unions, will lead us to either clarify what accompaniment means or to abandon the use of that category. This goes back to the relationship of faith to the culture. We are called by our faith to encounter the culture, but we encounter the culture with the truths of the faith and call it to a transformation. In other words, to conform itself ever more to the truth which God has written in nature itself and in particular on the human heart. But if that notion of countering the culture is not theologically informed, not understood correctly, the Church begins to look like it's running after the culture. In other words, that it's trying to mimic the culture. Now if the culture were perfectly Christian, it still wouldn't be correct, but the faith wouldn't be harmed. But we’re living in a culture which is anti-life, anti-family, anti-religion. So to give any impression that the Church endorses such a culture—this is folly. MJM: Yes, it seems like that. I mean, the Holy Father admonished priests against turning the confessional into a “torture chamber”; but it seems like now more than ever before, this culture, which is so Christophobic, if you will, needs to hear the voice of Mother Church in a way that's corrective …maybe not accompanying, but what I'm saying is that the act of trying to correct and help the sinner—isn't that the ultimate way of accompanying the sinner? Cardinal Burke: Exactly right! And that's all done with charity. We don't approach people shaking our finger, screaming at them, or acting hysterically. Our faith makes us serene, but it also makes us firm and steadfast. And so we address the culture with the truth of the moral law and the truth which Christ Himself teaches. And, actually, in truth, that's what the culture really desires. The culture has no respect for a Church which simply says: “Oh, everything is just fine” and endorses it. This culture expects the Church to address it with a challenge. Oftentimes I’ve thought of it in terms of the relationship of parents with children. When children are misbehaving, children need to be corrected and guided. If parents simply coddle, “oh, you’re just fine, that's all right”—the children grow up in a very disordered way and have great problems. And the children don't respect their parents for that. MJM [chuckling]: I can tell you, Your Eminence, as the father of seven children, I don't accompany my children so much. I love them and correct them when it's needed, but accompany them? What’s that mean? Cardinal Burke: Exactly. Even as a teacher, I've corrected students and had them scream at me: I hate you. I’ve had parents tell me that the child, you know, runs out of the room saying: I hate you. But I think, ultimately, that child, that young person, will be so grateful for the correction received. It may not be immediate gratitude but that's what the important thing is – that we have eternity and the eternal good of the child and even also the eternal destiny of the culture and can act accordingly. MJM: Right. You know, Your Eminence, Catholics have been through a lot over the past decade, with the priest scandal, the abdication of Pope Benedict and this rather unconventional pontificate of Pope Francis. And now this. I know we're running a little low on time here, but what is your advice for faithful lay Catholics should Pope Francis continue to not answer you dubia? Cardinal Burke: My advice is this, and it's inspired by the truth, the reality that Christ is alive for us in the Church, in her teaching, in her Sacraments, her life of prayer and devotion and in her discipline: Continue to steep yourself in the knowledge of the faith and the knowledge of Christ as He is alive for us in the Church. Study the Catechism of the Catholic Church and other expressions of the Church's constant teaching, for example, the apostolic exhortation Familiaris Consortio of St. John Paul II. And then continue to deepen your participation in the Sacred Liturgy and prayer life at home and devotional life. And at the same time, strive to conform your life evermore to the truths of our faith, following the Church's moral teaching and the teaching of the moral law. Today, after the Post Communion Prayer, we prayed in the Ordinary Form that we would be torches to welcome Christ by our prayer and witness to His truth, and that's what we ought to be concerned about. And if we do that we will be encouraged and won’t let ourselves get worn down by these great difficulties through which we're passing now. MJM: Your Eminence, I was born in 1966, basically a child of the Second Vatican Council, and all my life it seems there has been a pattern of gradual diminishing of Sacred Tradition and replacing it with something new. You know, Communion in the hand or altar girls or easy annulments and all this. Pope Francis describes himself as one who is acting in faithful accord with the true spirit of the Second Vatican Ecumenical Council. And I'm wondering, is there any concern in your mind that what we're seeing now is in fact a following of some sort of continuum of that spirit of Vatican II that has less to do with Francis and more to do with a new orientation of the Catholic Church altogether. Cardinal Burke: That is a legitimate concern. And whenever I hear this language—the ‘spirit of the Vatican II’—I am immediately alerted because there's no question, it's been demonstrated and can be demonstrated more that a lot of what happened in the Church after the Second Vatican Council, which invoked the Second Vatican Council, had nothing to do with what the Council Fathers taught. We saw it in the devastation of the Sacred Liturgy and in other aspects, as well. So I think that what we must do is return to the constant teaching of the Church as it's expressed in the Second Vatican Council, but in all of the ecumenical councils and in all of the authentic teachings of the Church down the centuries. Only when Catholics are well steeped in the teachings of the faith are they going to be prepared to give that witness which is needed today and also will they be prepared to be strong members of the Church and keep the Church strong. We're suffering today from decades of poor catechesis, or no catechesis at all. And all of that is reaping its effects. But we have the tools to address it and we need to use them. And I see a lot of signs of people who really want now to know their faith and deepen their knowledge of the faith. And they want the Sacred Liturgy to really be what it is meant to be, an encounter with Heaven in all its beauty. These people are also deeply concerned to learn how to lead a good and moral life. MJM: Last question, Eminence, if you could say something that would help me out. We're members of the Catholic press, and there are many members of the Catholic press who support you and the three cardinals. But we want to be part of your solution. We don't want to be part of the problem. What do you want us to do as this dramatic dubia situation unfolds? Is there something that you would rather we didn't say? In other words, what's the best thing that we can do to help you in this position that you're in? Cardinal Burke: I think the best thing you can do to help, and a number of you have been doing it already, is simply to print the truth but in a serene way to maintain absolute respect for the Church in all her aspects, including the petrine office, which is essential to our life in the Church. But at the same time to speak clearly the truth in a loving way. And if you do that, as a number of you have been doing, that will really be helpful. We don't want to contribute to the division by taking a very aggressive and outspoken approach, which will divide people and will cause people who don't understand all of what's going on, to be scandalized. That we want to avoid. But I think if you express the truths of our faith in this serene and loving way that will help everybody, including those who may not yet understand the difficulty that we're in. MJM: Your Eminence, I really appreciate your taking the time to answer these questions. I think it goes without saying that we're all praying for you and we're so grateful for the stand you've taken. And if there is anything, ever, at any point that we can do to help you out, please let us know. And please be assured of our support and prayers as you move forward. Cardinal Burke: Thank you. Keep praying for me and I’m really grateful for it. And I've really enjoyed talking with you this morning. You missed it! This interview appeared in the December 25th print edition of The Remnant. Subscribe today!